Last month I shared with you a vision I have of KMA physicians uniting on issues of importance to our profession and truly impacting change. I’m excited to report it’s happening! I would like to take the opportunity to recognize some of the individuals who are making a difference in the lives of patients and the practice of medicine. There is no shortage of kudos to distribute related to our incredibly successful Focus on Flu campaign. The campaign kicked-off with a press conference in the rotunda of our state capital, where I was joined by President-Elect Brent Wright. M.D. and Foundation for a Healthy Kentucky President and CEO Ben Chandler. KMA members from across the state have united to spread the important messages about flu vaccine and prevention. Lexington Medical Society President Tuyen Tran, M.D., appeared on the morning show for Lexington’s FOX affiliate on Sept. 19, the day after our press conference. He administered flu vaccines to three of those anchors. KMA Community Connectors from Paducah to Winchester published op-eds in support of the campaign. Even our youngest members, our medical students, contributed to the cause by submitting pieces to the University of Louisville and University of Kentucky student papers and taking ‘flu shot selfies’ with our Focus on Flu band aids. 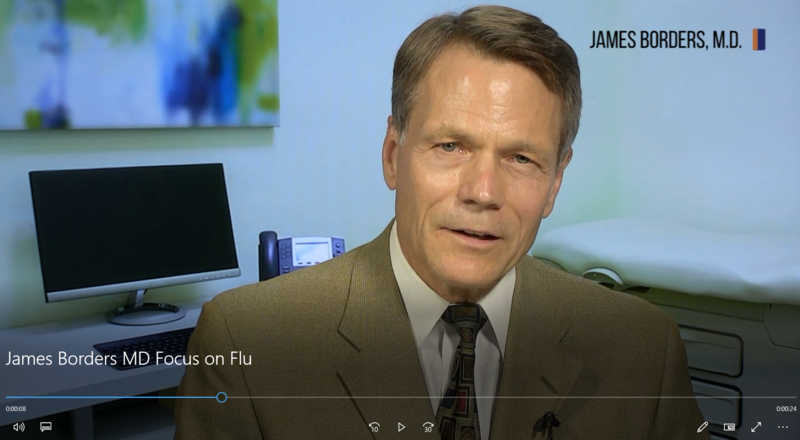 Doctors Casey Lewis, Mamata Majmundar and James Borders all starred in short online ‘Flu Myth Busters’ videos that have debunked common flu misconceptions on Twitter and on our website. Norton Healthcare infectious disease specialist Dr. Paul Schulz also stepped in to help KMA host its first-ever live Twitter Q&A regarding the flu, during which more than a dozen questions from the public were answered. We’ve also had members out in their communities meeting with local officials to help spread the word about flu vaccination. Dr. Rebecca Chatham in Danville, and Dr. Don Wilson in Maysville and KMA board member Dr. William Thornbury in Bowling Green both attended Focus on Flu events with the Foundation for a Healthy Kentucky and helped answer questions and even administered vaccines. 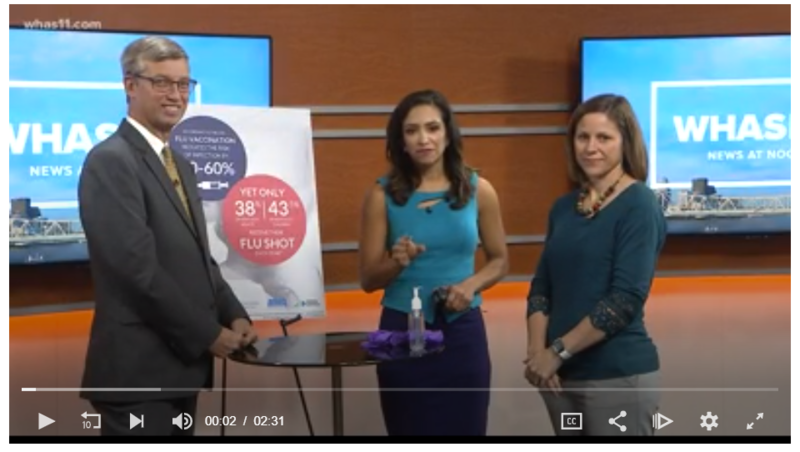 In Louisville, Community Connector Dr. Lori Caloia appeared with me on a segment for WHAS11 Great Day Live and administered a flu shot to anchor Juliana Valencia. On a different front, Dr. Casey Lewis also recently helped us tackle an administrative barrier from Anthem. The insurance giant was proposing a lab schedule fee change that would impact reimbursement rates for many common pediatric tests, including rapid cultures for influenza and strep. Dr. Lewis, KMA and the Greater Louisville Medical Society worked together to push back on the proposed change, and Anthem announced that it was rescinding the policy on Sept. 18. In its statement announcing the decision, Anthem credited input and feedback from individual health care professionals. Another great example of medicine uniting to protect our patients and our profession on a national level occurred earlier this fall, when the AMA, KMA and more than 150 other associations and groups representing numerous specialties, sent a letter to Centers for Medicare and Medicaid Services (CMS) Director Seema Verma. It applauded the proposed reduction of documentation requirements, but expressed concerns about proposed collapsing of office visit codes and reduction in payment for office-based procedures. Although the proposal to collapse codes would have, at least in theory, financially benefitted some specialties, medicine came together as a profession to speak with a united voice. The consensus statement encouraged CMS to collaborate with the medical community to work through the complicated issues. Finally, I’d like to recognize the graduates of KMA’s Kentucky Physicians Leadership Institute (KPLI). The program was recently announced as the recipient of MediStar’s A.O. Sullivan Excellence in Education Award, to be presented on Oct. 30. The KPLI was selected from a pool of very distinguished nominees, and I believe it is the work of the physician leaders who have completed the program that set our nomination apart. KPLI graduates are doing incredible things for medicine and in their communities, and I can’t commend their work enough (a few of them are mentioned above). Three other KMA members will also receive MediStar Awards, including Community Connector Sandy Shuffett, M.D., who has been named the Dean Dorton Physician of the Year, and Sarah Moyer, M.D. and Bryan Loy, M.D., who were named recipients of the Centerstone Healthcare Advocacy Award. 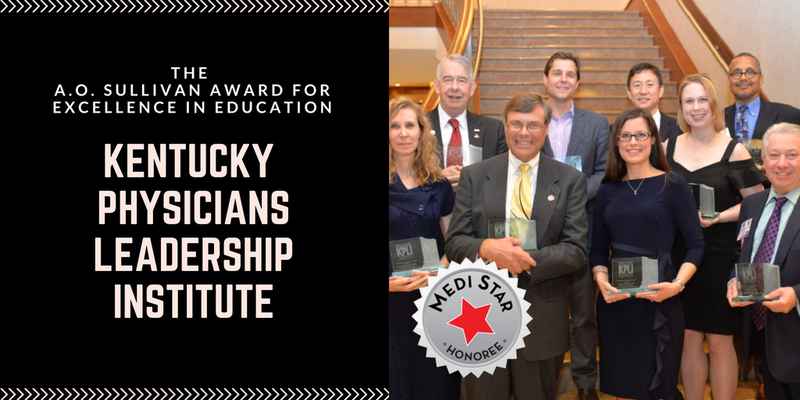 Between our members and our KPLI program, KMA represents four of the seven 2018 MediStar honorees. Our work is never complete, but I’m very encouraged by the willingness and enthusiasm of our members to come together on the issues where we can make a difference. Imagine what we could accomplish if all 7,000 KMA physicians asked themselves, “What can I do to make a difference in the lives of patients and our profession?” I’d love to find out!